DEVIL WORSHIPWhat is Devil Worship - Really? This article is copyright © 2006 Geifodd ap Pwyll. As a Devil worshiper, I define a "Devil" as any spirit who becomes a cultural scapegoat figure, i.e. a god or goddess who is blamed for "evil" (however the word "evil" might be defined) in a conventional religion. I believe the most powerful Devils are the ones who were never worshiped originally - Devils like Apep in Egypt, Loki in Northern Europe, and Satan in Christianity. Slightly below these, in my view, would be the Devils who were originally popular deities, but who ended up getting the short end of the stick and became scapegoats - like Ishtar, Beelzebub, and Set. The word "Devil" is etymologically descended from the Greek diabolos, which in turn is taken from a combination of dia- and ballein, meaning "to hurl." The word therefore means something to the effect of "One who hurls" or "One who throws across." A Devil is a spirit that incites doubt and "godlessness" among human beings, thereby "throwing across" or obstructing conventional opinion-makers. In this context, Devils are typically hated and feared in popular religions as "evil spirits." But by inciting doubt, Devils put humans into situations in which we are forced to re-think everything we believe. And by inspiring humans to put themselves before "God" or "the gods," they cause us to move away from authoritarian dogma and superstition. Thus, Devils are not so much "evil spirits," but rather slandered heroes who champion humanism and intellectual power. As the Powers of Darkness, they may often seem dark and spooky; as the "Gods of Godlessness," they may seem socially unacceptable. But they are really only "evil" in the eyes of conventional opinion-makers, who want humans to remain as gullible and superstitious (and controllable) as possible. Objectively speaking, nothing in existence is either completely "good" or completely "evil." The point to Devil worship is not to skin cats or vandalize churches. Instead, it is about celebrating the spiritual scapegoats of history, who are wrongfully blamed for whatever the majority calls "evil." It's about rebelling against authoritarian creeds and dogmas, and fighting against persecution in all of its forms. Being a Devil worshiper is much much harder than just reciting the Lord's Prayer backwards or "blaspheming the Holy Spirit." This is because any good Devil worshiper will stick his or her neck out to defend even Christians from persecution when necessary. When I say "fighting against persecution in all of its forms," I mean persecution in ALL of its forms - no matter who or what it's being directed toward. This is a difficult path to follow, because the Devil worshiper, by his or her very existence, tends to earn more enemies than friends. This is because most humans are overly simplistic thinkers, who'll make anyone or anything into a scapegoat just so they don't actually have to think about the nature of existence. Such people do not like to have their "mental graveyards" desecrated. There are even people who call themselves Satanists who are guilty of such simplistic thinking. Every culture on Earth is guilty of ostracizing and scapegoating others in order to make the terrors of existence more "bearable" for themselves. It's much easier to blame others for what you don't like, rather than face up to the fact that we are all living in a dark universe. The path of the Devil worshiper is a lonely one indeed. Devil worship is almost always hated, feared, and misunderstood by conventional religionists, precisely because it is the nature of a Devil to be hated, feared, and misunderstood. You might say that we balance out the worship of the "lighter" deities, but in a way that is far more socially-oriented than just practicing a few "black masses" here and there. The job of a Devil worshiper is to get people to think to a heretical, even godless degree - which is something that even some Satanists don't like very much, because it threatens their control over others. Since there is undoubtedly more than one Devil in the various cultures of the world, then not all Devil worshipers will necessarily be attracted to the very same one. Some may choose to follow the Norse Loki, while others may take a liking to the Semitic Lilith. Some may choose to honor more than one. Therefore, it is important for a Devil worshiper to clearly identify what Devil or Devils they are worshiping - unless they wish to keep such knowledge private, of course. 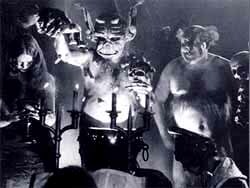 Devil worship is sometimes called Diabolatry, a word that comes from a combination of the Greek diabolos and latreia ("worship"). The word "Diabolator" is essentially just a synonym for Devil worshiper. Although there are crazy people in every religion, the vast majority of Devil worshipers are really law-abiding citizens who do not practice such things as human sacrifice. People of other religions may think we are a bit strange for claiming cultural scapegoat figures as our gods (instead of just following the same old popular gods that most other folks prefer), but most of us are pretty sane and rational people who can be quite friendly. We work jobs to support our families, we take care of our kids (like all good little goats should! ), and we are just as horrified by the things we see on the evening news as anybody else. It has been proven that throughout history, there have been far more many crimes committed in the names of Jehovah, Jesus Christ, and Allah than there ever have been in the name of Satan; yet people do not typically use the term "Christ worship" to be synonymous for criminal activity. Therefore, it makes even less sense to use the term "Devil worship" as a label for criminals. Thus, the idea of claiming that someone is a criminal simply because they worship a particular deity is pure nonsense! Devil worshipers are not limited to any particular ideology or paradigm. There are many possible interpretations of who and what the Powers of Darkness are and how one should worship them, which therefore means that there are many different possibilities as to what a Devil worshiper can believe. He or she can be monotheist, duotheist, polytheist, or even pantheist. And contrary to "common knowledge," most Devil worshipers are not duotheistic believers in "good versus evil." In reality, there are no more justifications for the use of terms like "Witch," "Satanist," "Devil worshiper," or even "Christian" as descriptions of religious rivals, whether within any single religious group or among extended siblings. The practice of such slander should be seen for the sociopolitical maneuvering that it is and eshewed as repugnant, while a reflection of self-description should be regarded with the proper respect that it deserves. This website is a testament of my faith and a continual work in progress. It was first created in December of 1997. It has since gone through several incarnations, known variously as "The Symposium of Set," "The Tomb of Geifodd," "Geifodd's Diabolatry" and "Geifodd's Demonolatry." This current incarnation was first conceived and developed in April of 2005. To learn more about the beliefs and practices of your friendly neighborhood Devil worshiper, please feel free to browse the links listed on my site map. To contact me, click here.